After morning pickup in Brisbane, transfer to the ferry that takes you across Moreton Bay. When you arrive at Moreton Island, travel by 4-wheel drive (4WD) vehicle to the beach and along Middle Road. Moreton Island is the world's third largest sand island. Most of the island is a protected national park without paved roads, making 4WD an essential mode of transportation. Admire the scenery as you pass eucalyptus forests with some trees that are 250 years old. Head to 'the Desert’ for a classic sandboarding experience on Moreton Island. When sandboarding, you can reach speeds of up to (50 km) per hour. Despite the potential for speed, everyone from beginners to speed demons can enjoy the activity and modify it to their comfort level. After the sandboarding excitement, head to a lake where you can take a dip in the blue waters or relax on a white-sand beach while your guide serves up a tasty picnic lunch. Then head to the Tangalooma Shipwrecks for a guided snorkel tour around the 15 submerged shipwrecks. The wrecks are located only (50 meters) from the beach, making them easy to reach. Enjoy watching a range of aquatic life swim around the vicinity, including parrotfish, trevally, blue-tang surgeonfish (dory) and clown fish. 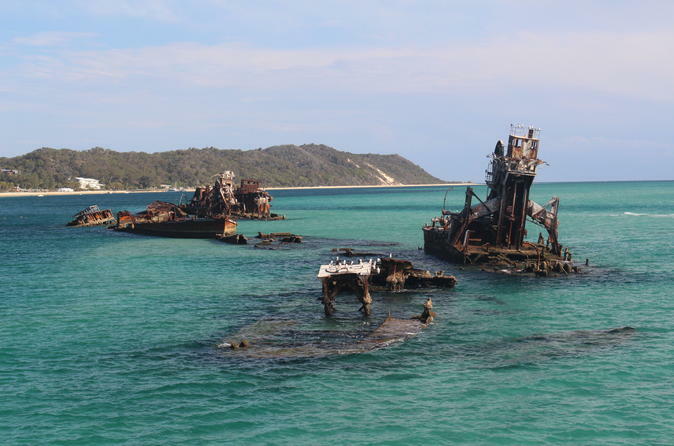 Alternatively, take a kayak tour in the area of the Tangalooma Shipwrecks, observing the shipwrecks from above. Please note: Snorkeling is subject to tide and weather conditions and may change without notice. Kayaking may be offered as an alternative to snorkeling if conditions are unfavorable. At the end of a full day, enjoy the sunset over Moreton Bay as you return by ferry to the mainland and transfer back to Brisbane where your tour ends. Please note: The itinerary may change depending on weather and tidal conditions. First of all, Guide is super fun and professional at his job. He got us everywhere in moreton from sand hill and wreck beach. Thanks for everything. The Snorkeling was absolutely awesome!!! Unfortunately we couldn't get to the sandboarding due to cars getting bogged. Not up to the standard I usually find on Viator. Pick up went smoothly at the bus stop although the transport was a bit shabby and crowded. The ferry ride was fine. When we arrived on the Island it turned out a set of keys was lost to one of the 4wd vehicles. A good 30 minutes was wasted looking around for the keys. Some of us were then taken to the”desert” to go sand boarding on our own while the driver went back to get the rest of the group. They had waited so long, they decided to go kayaking and so only three of the other 10 came to the desert. The driver then took us to a tent for lunch which was ham sandwiches and fruit. We walked to the beach and went up and down the shore which was really pretty and peaceful. After, they took us to the beach in two loads to snorkel. We actually kayaked instead because we hadn’t gone before and there was only time for one thing. This company needs a better backup plan when things go wrong. There were other slightly more expensive tour groups. I recommend one of those. A great adventure! Only reason we did not rate it a five: The company should have better vehicles to pick up passengers with in Brisbane. We were squished in like sardines in a non air conditioned vehicle for the long ride to the ferry. Otherwise our guide, Jay, made sure everyone enjoyed their trip. Definitely a picnic lunch as advertised was a prewrapped sandwich and a granola bar. 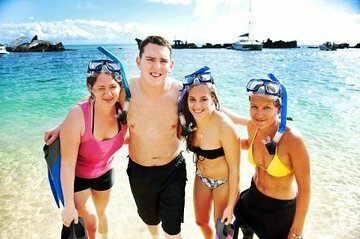 If you love snorkeling, this is a must do trip. What a fantastic day I had. It was perfect in every single way and our guide was so much fun and very knowledgeable. The sand surfing was great and the snorkeling once in a lifetime experience. This is a must do tour! The 4WD and the equipment is a bit old and the shower facility is quite poor. The whole trip was not as smooth as we thought because the tour information wasn't that clear at the beginning. However, the highlight is the sand boarding which is worth to try once in a life time. This was a fun and great tour led by our guide Adrian. The snorkeling was a surprise hit and well led. I do wish time permitted a greater exploration of the island but the ferry schedule limits this. Two ideas for making this better: 1 the equipment and facilities of the company need improvement. The male wetsuits were tattered and old. The campsight where we had lunch was very poorly maintained with trash strewn throughout the eating area. 2 the lunch was of poor quality as has been mentioned in other reviews. It's not that difficult to put together a decent lunch. Instead, soggy sandwhiches and generic store brand cookies, granola bars, and soft drinks - and again, consumed in a poorly maintained camp area was a bad experience.